Home #BotanyBus2015 All aboard! Dr M’s #BotanyBus2015 extravaganza! 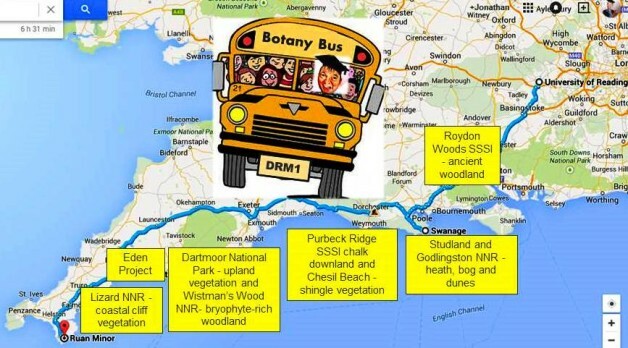 This year the #BotanyBus took a two week trip to some of south-west England’s finest botanical hotspots from Hampshire through Dorset and Devon all the way to the Eden Project and our final destination, the glorious Lizard District of Cornwall – Britain’s most southerly botanical hotspot! Ancient woodland at Roydon Woods NNR in the New Forest. Heathland and bog of the Poole Basin at Studland and Godlingston Heath NNR. Sand dunes of the Poole Basin at Studland SSSI. Chalk downland at Lulworth Cove at Purbeck Ridge SSSI and coastal scenery and shingle vegetation at Chesil Beach SSSI. Upland vegetation in Dartmoor National Park, and bryophyte and lichen-rich ancient woodland at Wistman’s Wood NNR. Botanical and horticultural extravaganza at the Eden project. Coastal cliffs and vegetation from Kennack Sands to Cadgwith. Plant communities and botanical rarities of serpentine cliffs from Lizard Village to Lizard Point. Cliff crevice, grassland and heath communities of very exposed sea cliffs at Kynance Cove. Dr M says: Check drmgoeswild.com for posts covering the twelve days of eXtreme botany featuring, well-worn books of Stace and veg key! How many NVC communities and plant species did we accrue by the end? Watch this botanical space!